Frae upper left: Naitional Congress o Brazil, Juscelino Kubitschek brig, Monumental Axis, Palácio da Alvorada an Cathedral o Brasília. Brasília (Portuguese pronunciation: [bɾaˈziliɐ]) is the caipital o Brazil. The name is commonly spelled Brasilia in Inglis. The ceety an its Destrict are locatit in the Central-Wast region o the kintra, alang a plateau kent as Planalto Central. It haes a population o aboot 2,557,000 (3,599,000 in the metropolitan aurie) as o the 2008 IBGE estimate, makin it the fowert lairgest ceety in Brazil. Housomeivver, as a metropolitan aurie, it ranks lawer at saxt. It is leetit as a Warld Heritage Steid bi UNESCO. Brasília hosts 119 foreign embassies. As the naitional caipital, Brasília is the seat o aw three branches o the Brazilian govrenment. The ceety an aa hosts the heidquarters o mony Brazilian companies sic as the Banco do Brasil, Caixa Econômica Federal, Correios an Brasil Telecom. The ceety is a warld reference for urban plannin. Plannin policies sic as the locatin o residential biggins aroond expansive urban auries, as well as biggin the ceety aroond lairge avenues an dividin it intae sectors, hae sparked a debate an reflection on life in big ceeties in the 20t century. The ceety's planned design includit specific auries for amaist awthing, includin accommodation, Hotel Sectors North an Sooth. New auries are nou bein developed for hotels, sic as the Hotels an Tourism Sector North, on the shore o Lake Paranoá. The ceety wis planned an developed in 1956 wi Lúcio Costa as the principal urban planner an Oscar Niemeyer as the principal architect. On Aprile 22, 1960, it formally became Brazil's naitional caipital. Viewed frae abuin, the main portion o the ceety resembles an airplane or a butterflee. The ceety is commonly referred tae as Caipital Federal, or simply BSB. Residents o Brasília are kent as brasilienses or candangos (the latter referrin tae those no born in the ceety, but migratit thare when the ceety wis establisht). Brasília haes a sui generis status in Brazil, as it is no a municipality lik nearly aw ceeties in Brazil. Awtho thare is nae legal definition for Brasília, the term is amaist aaways uised synonymously wi the Brazilian Federal Destrict, an sicweys constitutes an indivisible Federative Unit, analogous tae a state. 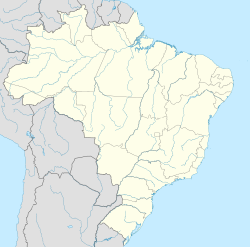 In the region, housomeivver, the wird Brasília aften refers anerlie tae the First Administrative Region athin the Distrito Federal (Federal Destrict), " whaur the maist important government biggins are locatit. This is in contrast wi the surroondin "satellite ceeties," which nivertheless are an aa pairt o the Federal Destrict, an as sic, Brasília, in a broader sense. Brasília Internaitional Airport is a major airline hub for the rest o the kintra, connectin the caipital tae aw major Brazilian ceeties an mony internaitional destinations. It is the third maist important airport o Brazil, in terms o passengers an aircraft movements. Brasília unner construction in 1959. Preses Juscelino Kubitschek ordered the construction o Brasília, fulfillin an airticle o the kintra's constitution datin back tae 1891 statin that the caipital shoud be moved frae Rio de Janeiro tae a place close tae the centre o the kintra. The plan wis oreeginally conceived in 1827 bi José Bonifácio, an advisor tae Emperor Dom Pedro I. He presentit a plan tae the General Assembly for a new ceety cried Brasilia, wi the idea o movin the caipital wastward frae the hivily populatit sootheastren corridor. The bill wis no enactit acause Emperor Dom Pedro I dissolved the Assembly. Lúcio Costa wan a contest an wis the main urban planner in 1957, wi 5550 fowk competin. Oscar Niemeyer, a close friend, wis the chief airchitect o maist public biggins an Roberto Burle Marx wis the landscape designer. Brasília wis biggit in 41 months, frae 1956 tae 21 Aprile 1960, when it wis offeecially inauguratit. Frae 1763 tae 1960, Rio de Janeiro wis the caipital o Brazil. At this time, resoorces tendit tae be centred in Brazil's sootheast region near Rio de Janeiro. Brasília's geographically central location fostered a mair regionally neutral federal caipital. The idea o locatin the caipital in the centre o Brazil wis first suggestit in 1891, but no defined till 1922. Frae the beginnin, the growthe o Brasília exceedit expectations. Till the 1980s, the govrenor o the Distrito Federal wis appointit bi the Federal Govrenment, an the laws o Brasília wur issued bi the Brazilian Federal Senate. Wi the Constitution o 1988 Brasília gained the richt tae elect its Govrenor, an a Destrict Assembly (Câmara Legislativa) wis electit tae exercise legislative pouer. Accordin tae legend, Italian saunt Don Bosco in 1883 haed a dream in which he describit a futuristic ceety that roughly fittit Brasília's location. In Brasília the day, thare are mony references tae this educator who foondit the Salesian order, an ane kirk in the ceety bears his name. ↑ "Lista do Corpo Diplomático e Organismos Internacionais". Cerimonial, Ministério das Relações Exteriores. Retrieved 2010-09-05. ↑ "Lucio Costa". Infobrasilia.com.br. Retrieved 2009-05-05. ↑ "Google Maps". Maps.google.com. 1970-01-01. Retrieved 2009-05-05. ↑ "About Brasilia". About Brasilia. Retrieved 2010-04-17. ↑ USA. "Travel destinations: Brasilia, Brazil - by O. Konheim". Helium. Retrieved 2009-05-05. This page wis last eeditit on 5 Apryle 2019, at 22:18.